The folds of 3D graphene create mesopore channels that work with the surface's micropores to increase the material's supercapacitive properties. Image: Yun Hang Hu/Michigan Tech. A material scientist at Michigan Technological University has invented a novel process for taking carbon dioxide and turning it into three dimensional (3D) graphene with micropores across its surface. This process is the focus of a new study published in a paper in Applied Materials & Interfaces. Converting carbon dioxide into useful materials usually requires lots of energy due to its ultrahigh stability. However, materials science professor Yun Hang Hu and his research team have now come up with a heat-releasing reaction between carbon dioxide and sodium that can synthesize 3D surface-microporous graphene. "3-D surface-microporous graphene is a brand-new material," Hu says, explaining that the material's surface is pockmarked with micropores and folds into larger mesopores, both of which increase the surface area available for adsorption of electrolyte ions. "It would be an excellent electrode material for energy storage devices." Basically, a supercapacitor material needs to store – and release – a charge. The limiting factor is how quickly ions can move through the material. The supercapacitive properties of 3D surface-microporous graphene make it suitable for elevators, buses, cranes and any application that requires a rapid charge/discharge cycle. Supercapacitors are an important type of energy storage device and have been widely used for regenerative braking systems in hybrid vehicles, for example. Current commercialized supercapacitors employ activated carbon with swathes of micropores to provide efficient charge accumulation. However, electrolyte ions have difficulty diffusing into or through activated carbon's deep micropores, increasing the charging time. "The new 3D surface-microporous graphene solves this," Hu says. 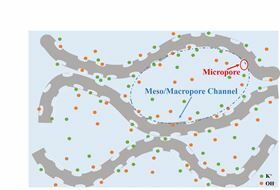 "The interconnected mesopores are channels that can act as an electrolyte reservoir and the surface-micropores adsorb electrolyte ions without needing to pull the ions deep inside the micropore." The mesopore is like a harbor and the electrolyte ions are ships that can dock in the micropores. In the new 3D surface-microporous graphene, the ions don't have to travel a great distance between sailing and docking, greatly improving the charge/discharge cycles. As a result, the material exhibited an ultrahigh areal capacitance of 1.28F/cm2, which is considered an excellent rate capability, as well as superb cycling stability. To synthesize the material from carbon dioxide, Hu's team simply added carbon dioxide to sodium and then increased the temperature to 520°C; the resultant reaction releases heat instead of requiring energy input. During this process, carbon dioxide not only forms 3D graphene sheets, but also digs out the micropores; these tiny dents are only 0.54nm deep in the surface layers of the graphene. This story is adapted from material from Michigan Technological University, with editorial changes made by Materials Today. The views expressed in this article do not necessarily represent those of Elsevier. Link to original source.